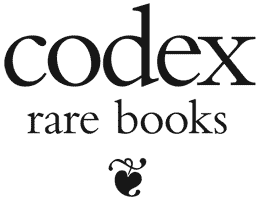 Codex Rare Books is a large database of titles, information and images of rare printed books from the 15th through the 20th century, in all fields, languages and places of printing. Codex seeks to present the universe that each rare book represents to a depth unparalleled by any other resource. Codex hosts higher-quality images of rare books than any other online resource — visually recording even the very texture of the paper upon which the book is printed. Codex Rare Books is a committed bibliophile’s paradise. It is an essential resource for any researcher, auctioneer, rare book lover, and lover of learning and reading.